Over the coming decades, water scarcity will present a significant socio-political challenge to the countries of the Arab region; for a number of countries, achieving SDG 6 alone is likely to be difficult. Intergovernmental water diplomacy can play an important role in supporting the achievement of SDG 6, alongside other SDGs, including through supporting cooperation around shared water resources and through economic and technical assistance and cooperation in the areas of water and sanitation. In a study on the potential for water diplomacy in the Arab region that we conducted as part of our postgraduate studies on United Arab Emirates (UAE) diplomacy, we identified a number of policy recommendations, including establishing dedicated departments at foreign ministries, ensuring an integrated approach to water in development cooperation, and establishing a regional center for water security and sustainability. We, as future diplomats, believe that water diplomacy can play a significant role in supporting the achievement of the 2030 Agenda for Sustainable Development in the Middle East and North Africa (MENA) region. How could this happen? For a number of Arab countries, achieving Sustainable Development Goal (SDG) number 6 (Ensure availability and sustainable management of water and sanitation for all) alone is likely to present challenges: the latest Sustainable Development Solutions Network’s (SDSN) SDG Index indicates that ‘significant’ or ‘major’ challenges remain in all Arab countries for achieving this SDG. However, water and SDG 6 are known to have important interlinkages with other areas of sustainable development: UN-Water, the interagency coordination mechanism for water, has identified interdependencies between Goal 6 targets and all other Goals, which are mostly positive, or synergistic. We believe that foreign policy, through intergovernmental water diplomacy, can play an important role in supporting the achievement of SDG 6, alongside other SDGs. Water diplomacy can be understood to have two dimensions: it can be used as a means to reduce tensions between and within states around water resources and to improve their management, including through trust-building and mediation; and it can be understood to also include economic and technical assistance and cooperation in the areas of water and sanitation. These two areas are obviously highly interlinked and overlapping. In addition, there are important synergies between the different SDGs that governments should consider when engaging in water diplomacy. For example, as UN-Water has pointed out, ‘well-defined procedures for consultation and provisions on conflict resolution in transboundary agreements’ (SDG target 16.3) can support the achievement of ‘implementing integrated water resources management at all levels’ (SDG target 6.5). Looking at the challenge from the perspective of our country, the United Arab Emirates (UAE), what role could water diplomacy then play in achieving a region that is both more stable and prosperous? This is the question that we recently set out to examine during our nine-month postgraduate programme at the Emirates Diplomatic Academy (EDA), which prepares Emirati graduates and professionals to become the country’s future diplomats. What can be learned from how other countries have engaged in helping other countries to address water scarcity issues through economic and technical means? 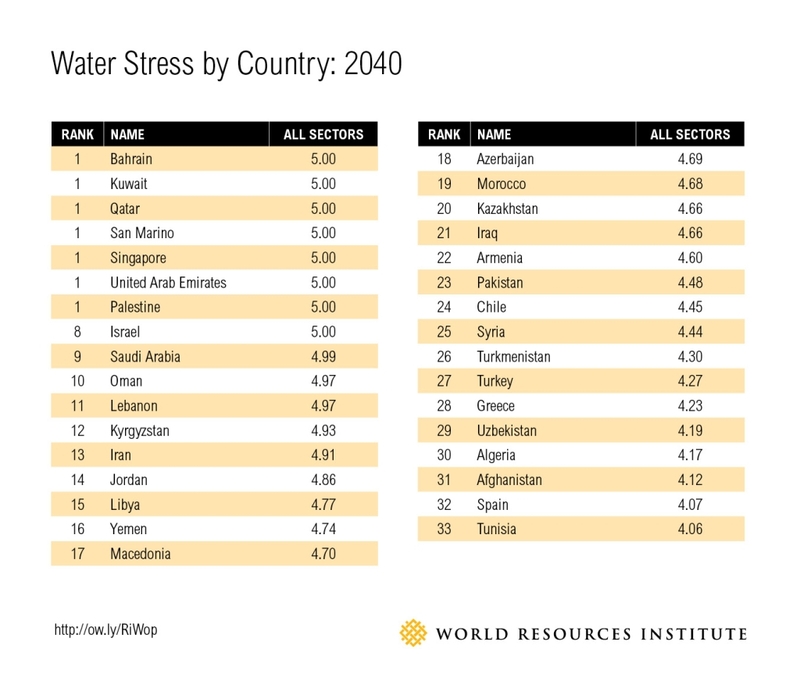 In answering these questions, we first examined a number of water-scarce and risk-prone countries and river basins in the MENA region, including Yemen and the river basins of the Nile, Jordan and Tigris-Euphrates. We then looked at three relevant cases of water management and mediation: links between social conflict and water insecurity in Somalia; evolution of the Mekong River Commission; and mediation efforts between India and Pakistan. Finally, we examined best practices in integrating water into development cooperation and technical assistance. These included the Netherlands, which has a strong track record of promoting water diplomacy, and Australia, which has selected ‘water for development’ as a core area in its development assistance. Establish a regional center for water security and sustainability that focuses on knowledge sharing and networking around water-related solutions, both political, economic and technical. We believe that our research project demonstrates that water diplomacy, if used strategically and effectively, can play a crucial role in supporting both peace and stability, and sustainable development more broadly, in the Arab region.